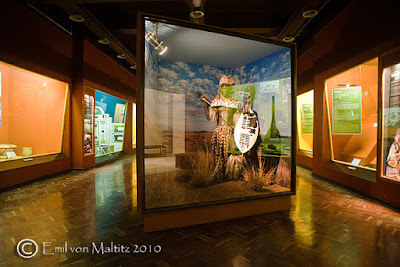 Over the Christmas period I finally had a chance to see the Zulu Warrior display at the Bloemfontein National History Museum in which an image of mine is used as the background. To be honest I was skeptical of the final print quality considering that the long side of the print is 5 metres! Confusing circles to the rescue. Thanks to the slight distance from the print that the viewer is forced to stand, and despite the fact that it was printed at 180dpi, the quality is fantastic. Nary a raw pixel to be seen (I'm positive the same can't be said if you stand at nose distance of course). The original shot is a panoramic stitch of two horizontal images from a D700 (so 12 megapixels in each frame, but with almost half an image overlap). Careful processing was required to enlarge the image without making the resultant print look 'digital' and pixelated. the premise of the confusing circles calculation is that the optimal viewing distance is the equivalent of the hypotenuse of the print, in this case just under 5.5 metres. However, viewers try to get as close as possible to see the warrior himself, meaning that they stand somewhere around 1.5 to 2 metres from the print at the furthest. Processing therefore had to 'trick' the eye into believing that the print was sharp. In the end a success.